Rivendell 2 ~ Reunion with the cousins, plus jan-u-wine's "The Gifts of the Three Hobbits". I was inspired to continue on with screencaps because I wanted to showcase another poem of jan-u-wine’s. The poem, however, is set in Minas Tirith after Frodo has recovered, and there are no film scenes that directly correspond to it. The film scene of Frodo waking up in Minas Tirith might do, but I’d already made multiple sets of it to go with other poems. Hmm, I thought. 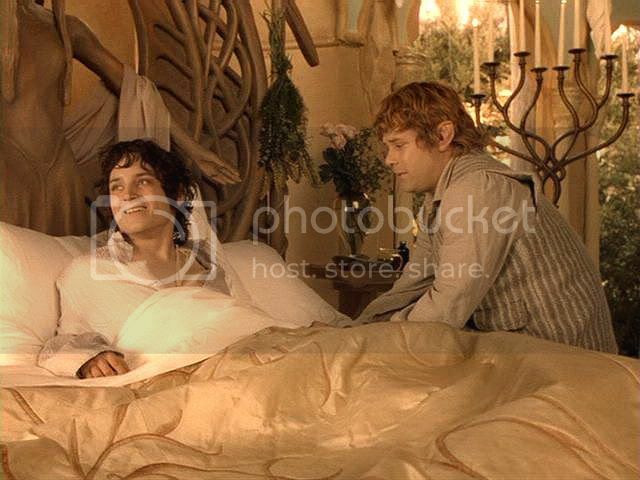 Perhaps its companion piece, the scene of Frodo waking up in Rivendell, might do very well? It’s not Minas Tirith, but it depicts the same sequence of events, inviting comparison: Frodo wakes up bathed in morning light to the sight of Gandalf, then is happily reunited with Sam and his cousins. Yes, it would do. 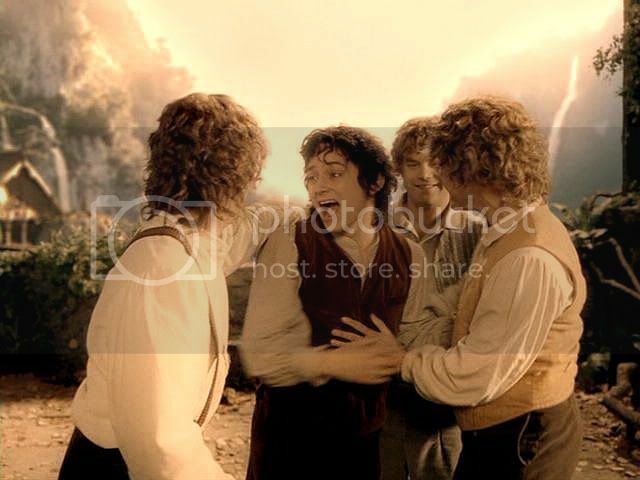 So here it is, a series of screencaps of Frodo’s joyous reunions—but in Rivendell, not Minas Tirith—plus jan-u-wine’s poem, “The Gifts of the Three Hobbits”. It's worth comparing the two scenes, actually, if only to provoke reflection on how much has happened to everyone between the two "bookend" scenes—Frodo waking in Rivendell and Frodo waking in Minas Tirith. 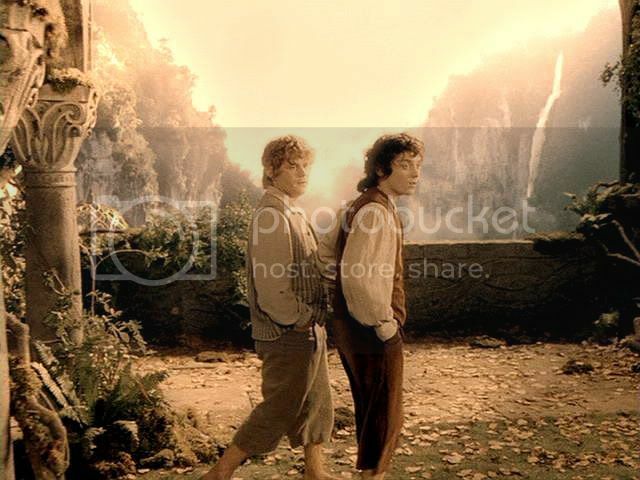 The film shows a lot, with no words at all, but only in the interchange between Frodo and Sam. If one had only the Minas Tirith reunion scene to go by, it would seem that Pippin and Merry had not grown much from the frat-boy cousins who illicitly set off fireworks, or raided Farmer Maggot's fields, or scampered out from behind the potted plants at the great Council to present themselves as companions on Frodo's "quest", or "thing". But the difference between what is exchanged between Frodo and Sam in the two scenes is extremely telling. In Rivendell, Frodo is simply ecstatic to be alive, and to see Sam alive. Sam, in his turn, is ecstatic to see Frodo alive. 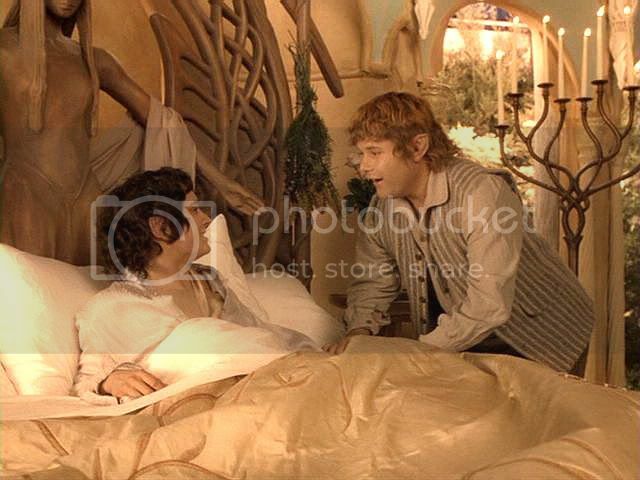 In Minas Tirith, Frodo is joyful to see his cousins, but, even in the midst of their gleeful bed-bouncing, the look he gives Sam shows how much beyond jumping on beds he has come. And the look Sam gives him is so full of love and knowledge and shared experience—the darkest and the most radiant—words cannot express it. I love the way the Minas Tirith "Frodo-wakes-up" scene recalls yet goes beyond the first version, in terms of Frodo and Sam, and Frodo and Gandalf. It is too bad that Merry and Pippin get short-changed, still portrayed as the juveniles they were at the beginning of the Quest. Like Gimli, the cousins have been assigned as primary bearers of the films' light and comic moments. But I am sorry the scene gives no sense of their intervening experiences of growth and sacrifice and maturation. Perhaps it is the case that the mere sight of Frodo triggers regression (and a desire to bounce on beds). Before the caps and poem, I am providing excerpts of the scene from the book and the film’s screenplay. I think the filmmakers did a very good job abridging this scene for the film, even though the process necessarily changed a number of nuances. In the film, for instance, Sam rushes in and grasps Frodo’s hand (thanks to Ian McKellen?). 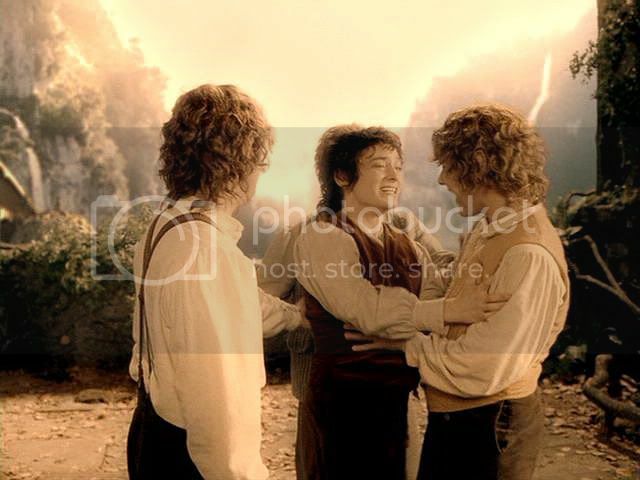 The motivation appears to be a simple, unthinking expression of love and Sam’s happiness at Frodo’s recovery. In the book, Sam grasps Frodo’s hand not merely out of love and happiness, but to satisfy himself that Frodo is indeed recovered. “It’s warm!” he exults—it’s been cold since Frodo was pieced by the Morgul blade, over two weeks prior. But there would be no way to convey this aspect of the story without additional dialogue. 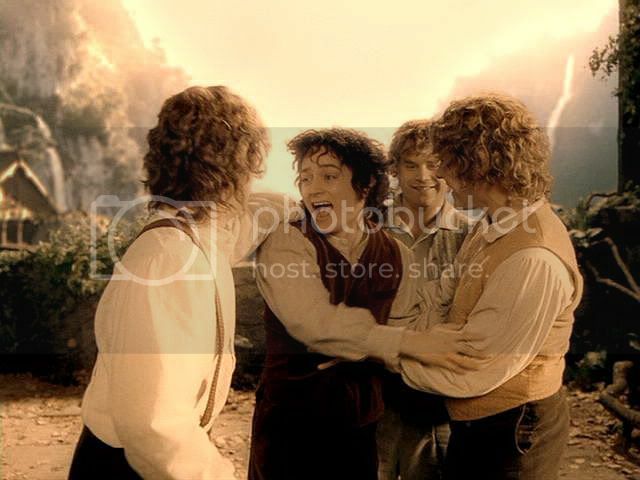 What does come through in the Rivendell reunions is more than sufficient: no viewer can doubt the happiness everyone feels at Frodo’s recovery (including Frodo), the love they share, or their joy at being reunited with each other again. So, whatever the changes from the book, the filmmakers managed to convey what they needed in not much film time, and not very many words. Book scene, from “Many Meetings”. 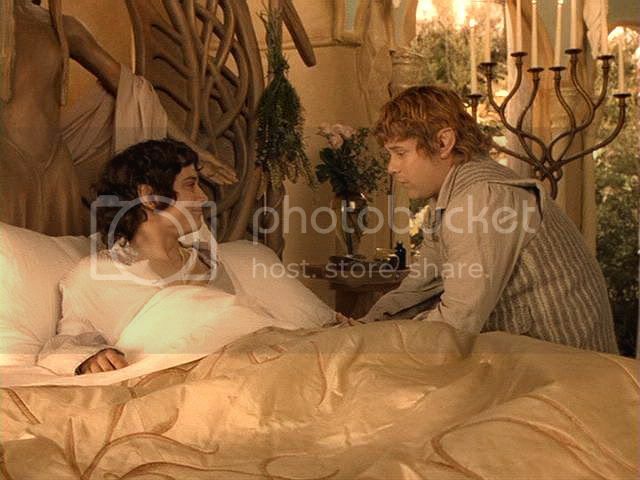 In the House of Elrond, four days after being carried unconscious from the Ford of Bruinen, eighteen days after his wounding with the Morgul blade on Weathertop, Frodo has woken up at last. Gandalf sits at his bedside in the morning light. After being assured that his companions are safe, they talk. Frodo wants to know what happened to Gandalf (he’ll find out at the Council), and at the Ford, and how he got to Rivendell. Answering in a roundabout way, Gandalf mentions Frodo’s bravery in the Barrow. Frodo asks how he could know about it, since he hadn’t spoken of it to the others. Gandalf says that Frodo has talked long in his sleep, revealing much of what is in his mind and memory. 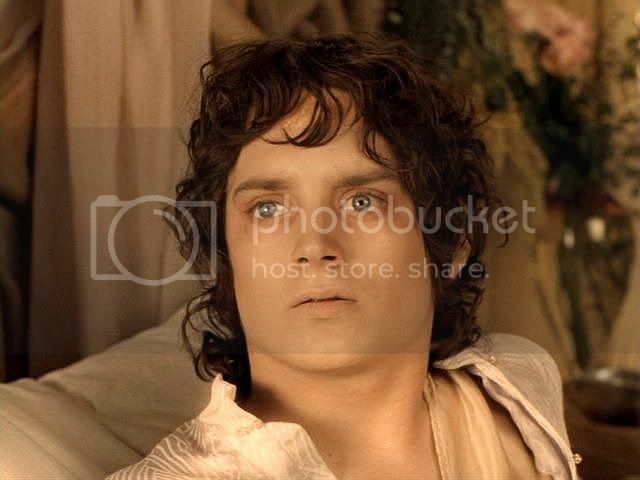 Frodo then listens to the tale of what happened at the Ford of Bruinen, and how the Black Riders were swept away. “Now we are safe!” Frodo says, closing his eyes. 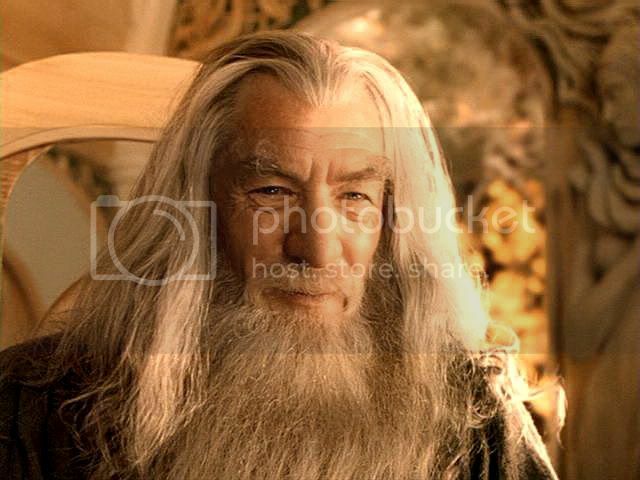 “Yes, you are all safe”, Gandalf replies, but qualifies his answer, adding, “for the present”. “For the present” appears to be enough for Frodo, and he sleeps again. There will be a celebration that evening, at which all the Fellowship will be guests of honour. 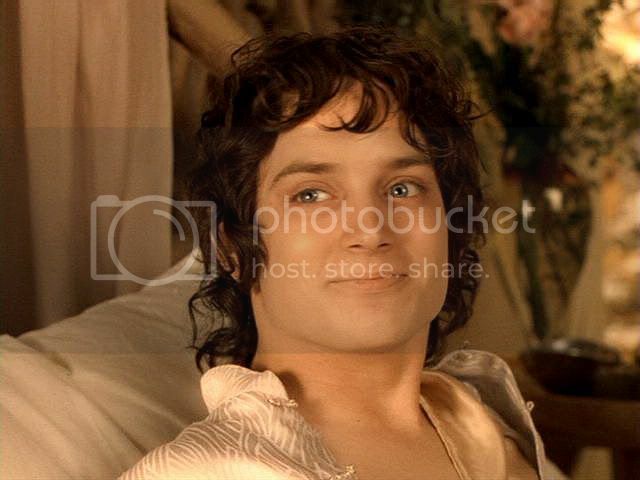 Frodo wakes refreshed, rises, and dresses in clothes of green cloth laid out for him. Looking in the mirror he was startled to see a much thinner reflection of himself than he remembered: it looked remarkably like the young nephew of Bilbo who used to go tramping with his uncle in the Shire; but the eyes looked out at him thoughtfully. ‘Yes, you have seen a thing or two since you last peeped out of a looking-glass,’ he said to his reflection. ‘But now for a merry meeting!” He stretched out his arms and whistled a tune. At that moment there was a knock on the door, and Sam came in. 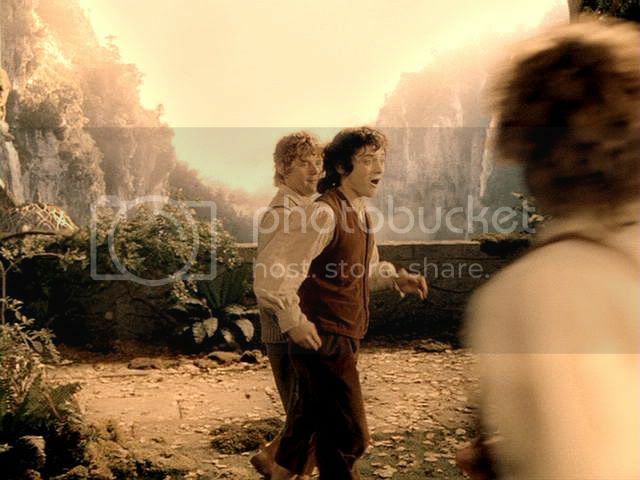 He ran to Frodo and took his left hand, awkwardly and shyly. He stroked it gently and then blushed and turned hastily away. Sam led him along several passages and down many steps and out into a high garden above the steep bank of the river. He found his friends sitting in a porch on the side of the house looking east. Shadows had fallen in the valley below, but there was still a light on the faces of the mountains far above. The air was warm. The sound of running and falling water was loud, and the evening was filled with a faint scent of trees and flowers, as if summer still lingered in Elrond’s gardens. ‘More than a meal! A feast!’said Merry. ‘As soon as Gandalf reported that you were recovered, the preparations began.’ He had hardly finished speaking when they were summoned to the hall by the ringing of many bells. Only part of the screenplay below has been capped for this entry. The caps begin after the flashback to Gandalf's escape, when Frodo says, troubled, "Gandalf? What is it?" After the Ford, Frodo is shown waking in a wash of strong morning light, all white and gold. Dressed in a clean night shirt, he is in a large carved bed; Gandalf sits nearby. 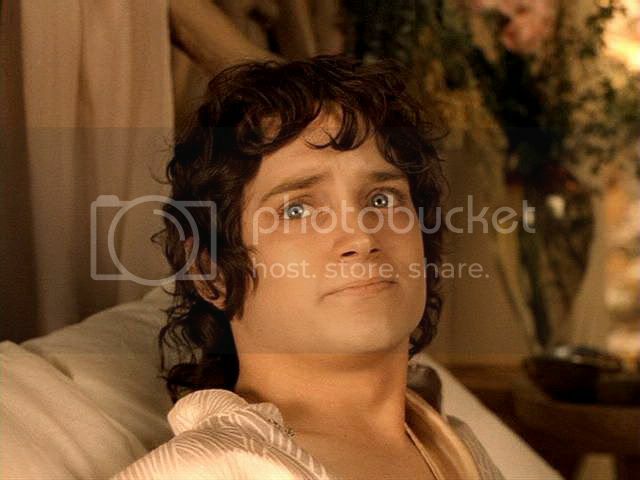 Frodo raises himself with difficulty, looking about him. 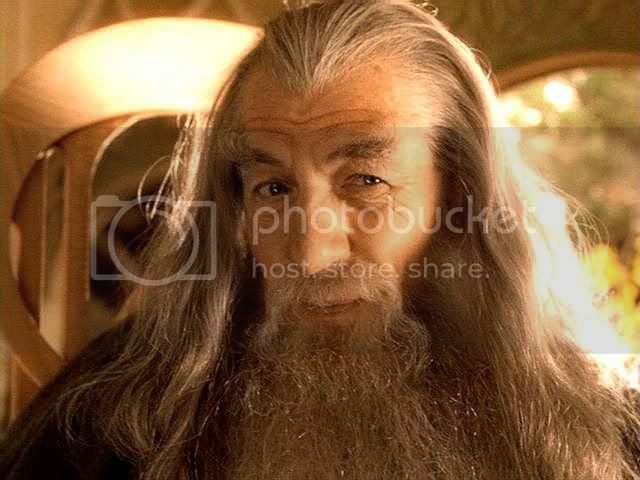 Gandalf: You are in the house of Elrond, and it is 10 o'clock in the morning, on October the 24th, if you want to know. Gandalf: Yes, I'm here. And you're lucky to be here, too. A few more hours, and you would have been beyond our aid. But you had some strength in you, my dear Hobbit. Frodo: What happened, Gandalf? Why didn't you meet us? Gandalf: I'm sorry Frodo. I was delayed. In a flashback, Gandalf’s last confrontation with Saruman and rescue from Orthanc is shown. 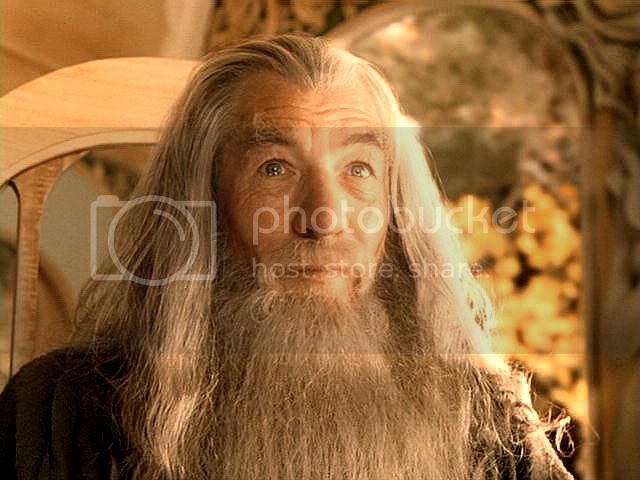 Gandalf's face is pensive. Frodo: Gandalf? What is it? Sam: [offscreen] Frodo! [entering] Frodo! Sam: Bless you, you're awake! Gandalf: Sam has hardly left your side. Sam: We were that worried about you, weren’t we, Mr. Gandalf! Gandalf: By the skills of Lord Elrond, you are beginning to mend. 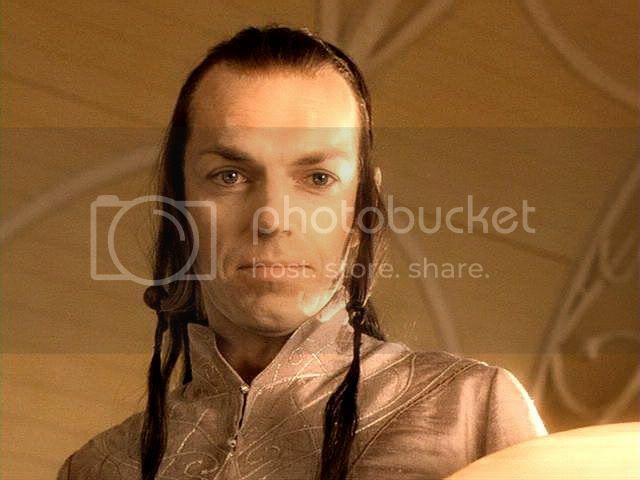 Elrond: [coming near] Welcome to Rivendell, Frodo Baggins. 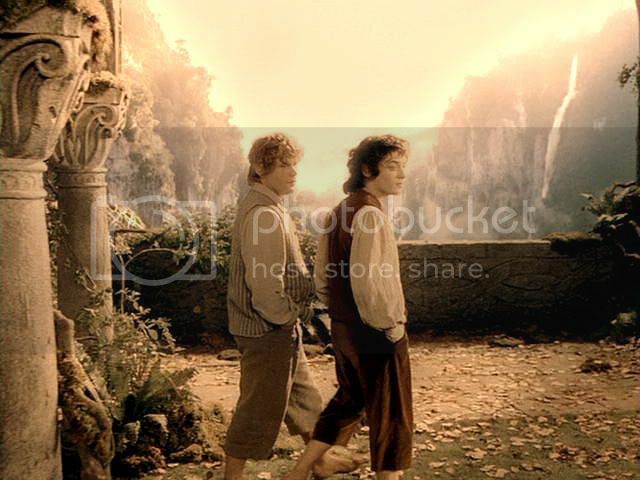 Frodo is shown up and dressed, walking onto his balcony in Rivendell and through the gardens with Sam, as seen in screencaps from the previous entry. 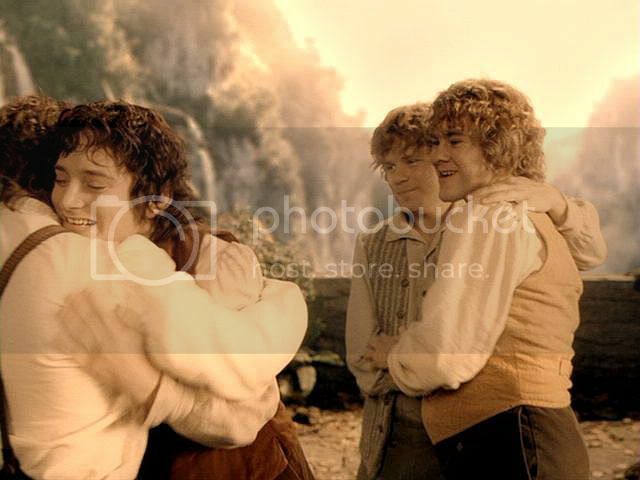 Then, Sam and Frodo see Merry and Pippin. A joyful reunion ensues. The screencaps below, taken from the fullscreen edition of the theatrical version, have been adjusted for brightness, contrast, and focus. Note: In case you skipped the introduction, this poem is set in Minas Tirith after the war, not Rivendell after the crossing of the Bruinen. Merry came to me today. as even a soldier of Rohan might. He tells me of Théoden King. remember those whose craft formed it. as surely as it has drunk blood? I wish only for your love. .
For a little while, cousin. For all the time which is given us. Pippin tells me of the siege. like fallen warriors at our feet. a last remainder of a soldier in the Great War. Within my heart, I know it matters not. it matters not whose life ended within this lonely circle. A wind smelling impossibly of the Sea touches my face. upon a moon-drenched stream. . The last of the winter apples. They are still sound, Pip. It is eventide within the Stone-City. and no lamp within the silence of my room. Heavy footsteps mar the quiet of the hall-flags.. It is no man that treads thus. No man should hear these steps, even. serene as a summer-hazed river. nor beg the simple gift of your love. than ever I have seen myself. shall be all that never more I can be. "....there lay his weapon, but the blade was smoking like a dry branch that has been thrust into a fire; and as he watched it, it writhed and withered and was consumed"
In my fancy, only the blade was destroyed: the hilt remained and was reforged for Merry, who certainly had cause to have great fondness for this sword. Did this really happen? I think not, for in the book, the next line reads, "So passed the sword of the Barrow-Downs...."
The survival of this sword is only a fancy of mine, the use of which I hope you will forgive. 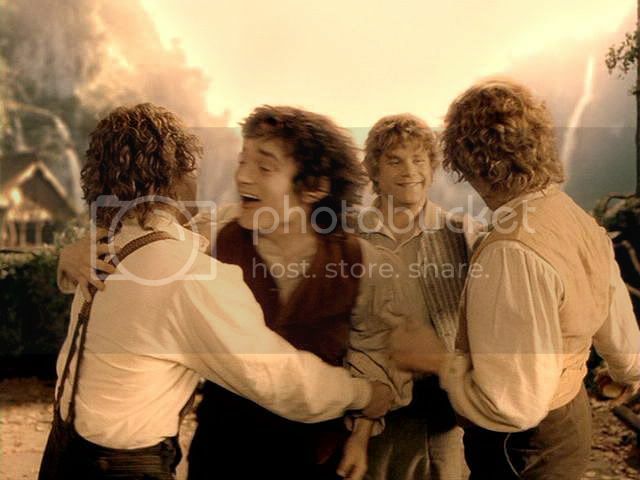 It's lovely to see Frodo so joyous, before he recommences walking his dark, difficult path. Yes, it is lovely to see him enjoying this respite before the plunge. He really does look *so* filled with happiness and joy in those scenes. Those are great notes about the difference in the qualities of light, Mews (Minas Tirith and Rivendell). You're right, they made quite a point of depicting Rivendell in its last autumn, however lovely and golden, the end of the age of the Elves. And in Minas Tirith, it's the dawn of the Fourth Age, the age of Men. You're right, too, how the films got so much across subliminally. Only when fans mull the films over do most of these details come to conscious appreciation. You have given these films a lot of thoughtful viewing, it is clear. 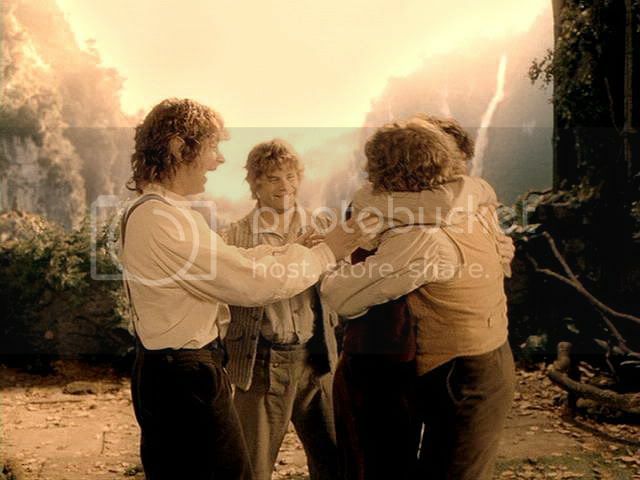 Two things: I love how he hugs Merry and Pippin in the same order as at the Gray Havens, but with such joy in this and also, even though this is terrific non-dialogue acting, especially on the part of Elijah, and he never drops out of character, in retrospect, years after first seeing the films, Elijah in this scene is so...Elijah. Touchy feely, the wide, happy smile that is Elijah's alone... I just adore this man. oh my god, I could not possibly agree more. And these images give us the only, images of Sam smiling until his wedding day. How I love this scene. I wish I were able to write poetry! I'm afraid I'm a rather prosaic person. "Prosaic", in the sense of "ordinary; unimaginative", I cannot grant you, Bagma. "A writer of prose", yes. Thanks for commenting! Ah - this deep golden light, this shimmering beauty of a dying age, and those hobbits within, this laughing reunion and unabashed joy! And then this lovely poem on top of it all... thank you, Mechtild. You're welcome, Simone. It's a beautifully done scene. Yes, "shimmering beauty". I'm a great fan of your fullscreen caps, Mechtild. Perfect for close-ups, and these are so beautiful! I compared them to some captures I made of the same scene from my widescreen DVD, and I have to say I prefer yours ~ particularly those Frodo-looking-at-Gandalf-and-Elrond shots. In my screencaps the top of his beautiful head is chopped off! It makes me wish I owned both versions. 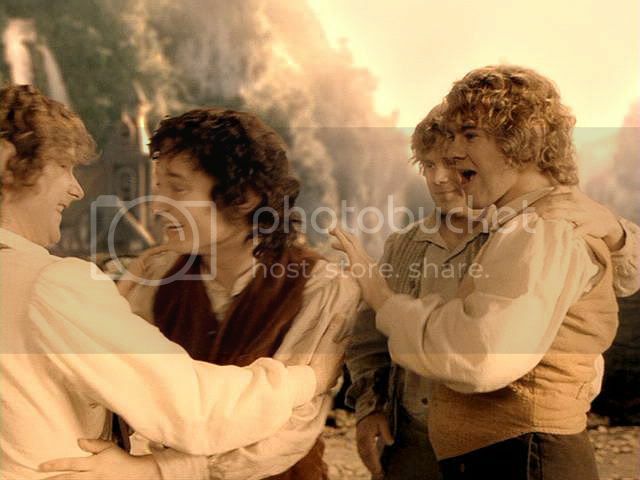 Lovely interaction between Sam and Merry here too as Frodo and Pippin are hugging. 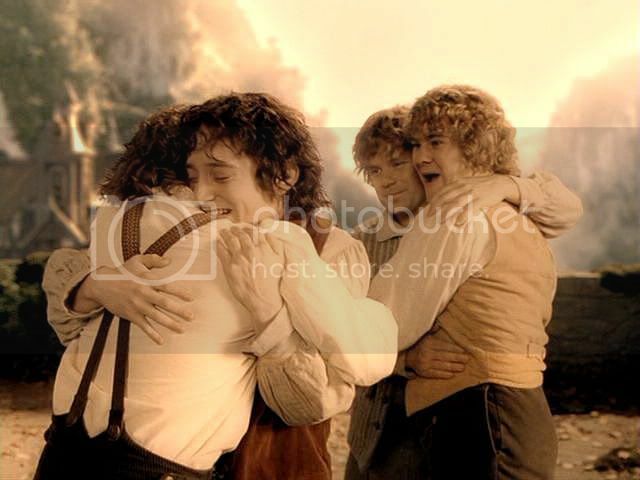 They are all so relieved and happy to see Frodo recovering, and he is obviously delighted to see them too. I adore those hobbits! Jan-u-wine's poem, as always ~ moving and beautiful. Thanks for stopping in, Blossom. I always love to know a fellow-screencapper has visited and enjoyed what she's seen. It makes me wish I owned both versions. You may *certainly* save these, you know. I have definitely saved yours! Yes, fullscreen is great for getting closer. But if I had your program, which makes larger widescreen caps than mine does, I might not feel the need for fullscreen. In my screencaps the top of his beautiful head is chopped off! 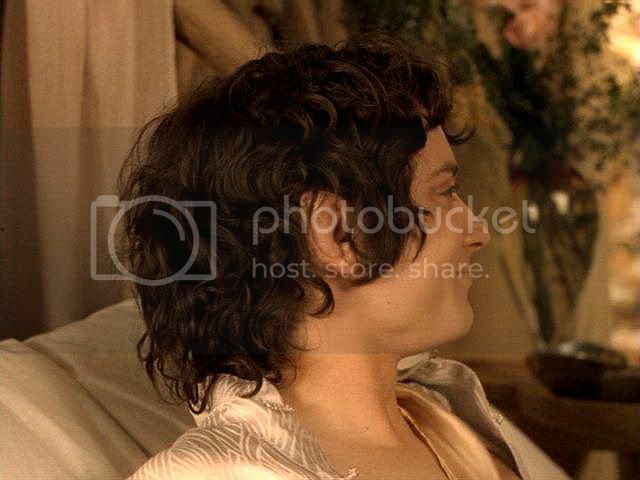 The thing you noted, that the top of Frodo's head (and/or bottom) got cut off in the widescreen version, is something that frequently happens. This one feature makes the fullscreen version worth having, in my opinion. You lose the sides of frames in fullscreen, true, but you often gain the top and bottom that have been masked (by the black bars) to transform the original camera frames to ultra-widescreen. That is a fine poem, isn't it? I love the idea of the cousins wanting to honour Frodo, and try to give him something back for what he lost. I have always imagined that Frodo envied them all a little, as heroes who stood up to great foes in battle and prevailed, unable to see his own accomplishment. And I imagine Merry, Pippin and Sam all humbly thinking what they did, however brave and valiant in their individual situations, was small potatoes compared to what he endured, if only Frodo could see it. How I love them all, and wish I was more like them. Such beautiful screencaps! 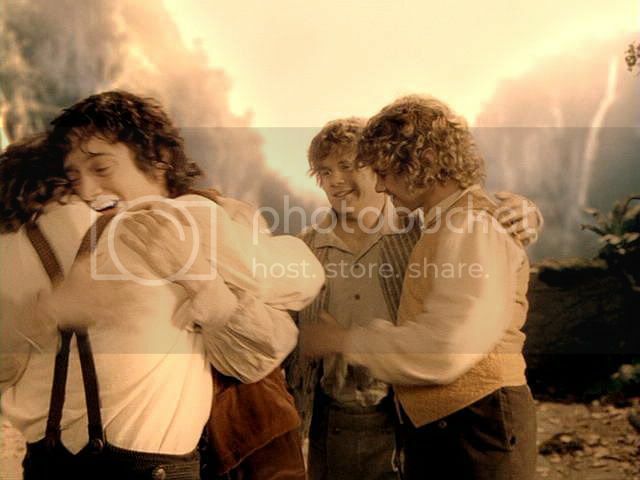 I confess I hadn't appreciated just how Sam's reaction changes from joy to deep concern as Frodo looks away from him. It is wonderful to see Frodo's expressions of joy dawning as he sees the approach of his cousins. I can imagine how relevant these emotions are to the recovery at Minas Tirith. This poem is a moving imaginative epilogue to the bed-jumping scene. I imagine it taking place some days, maybe even weeks later, when Frodo is strong enough to bear longer conversations and to hear some of the shattering news of battles and death. It unfolds beautifully, each encounter revealing so much. Such a beautiful line, recalling (for me) without being explicit Frodo's love for Bilbo as well as his parents, and his perfect understanding of what Theoden meant to Merry. 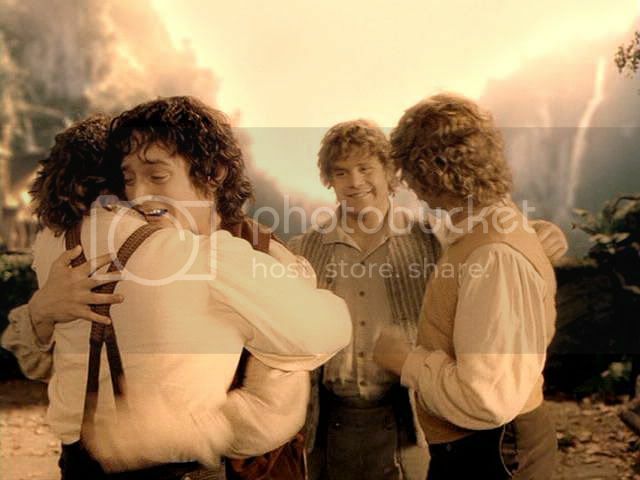 I love that the next person Merry offers his sword to is Frodo, acknowledging his primary role in the Quest, and symbolic of all his gratitude and fealty, yet needs their love to be re-acknowledged (re-forged), as if, after all that they have both been through apart, they are now different people. Pippin gives Frodo the gift of himself. Even though telling stories of battles and terrible loss, he seems to have an ease and intimacy with Frodo, their easy kinship strong and assumed. I imagine Frodo's relief and simple comfort at listening to the youthful voice which holds no awe or over-anxious care for him. He is not the Ringbearer to Pippin, but a beloved kinsman and friend always. And it is the absence of any need for words that makes the bond with Sam so profound. The shared intimacies and agonies of their journey have bound them inextricably together and taken them to a place beyond kinship or friendship. 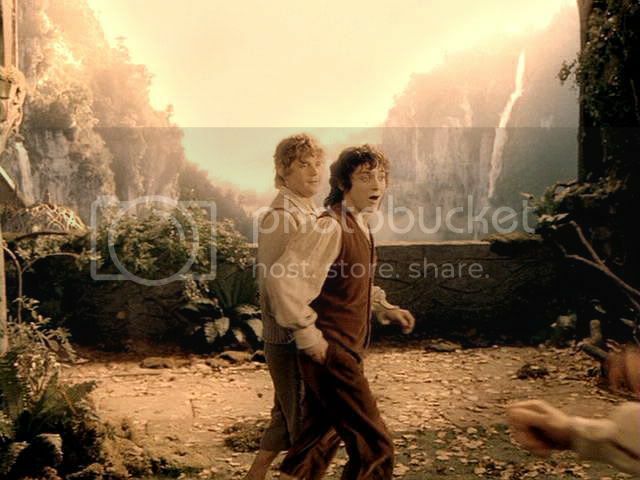 It is telling that Frodo cannot bear to look at Sam's damaged feet, and that Sam, with typical goodness, tries to cheer Frodo. Their laughter can never again be uncomplicated by greater knowledge. Already they have switched places - now Sam is the one with the greater destiny, and Frodo has pledged himself to the fulfillment of it. 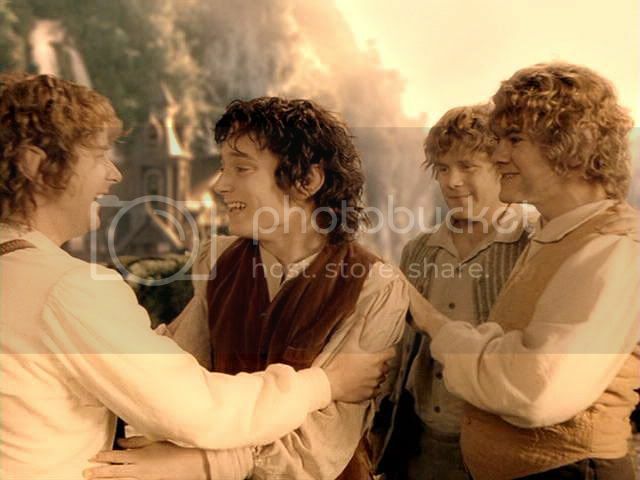 I love that Merry begs for the renewal of Frodo's love, Pippin never lost touch with it and Sam reaches a new and far deeper relationship with it, and a deeper understanding and respect for himself. Not only a plausible reading but a very moving one. Thank you for another beautiful visit, Mechtild and Jan-u-wine! Goodness gracious, what a comment. You have opened up the poem, which I thought I knew, and, through that opening up, shown me more not only about the characters named in it, but about their relationships with Frodo--from both his and their points of view. Thank you for the gift of this comment, AlienSoulDream. It lays across your palms as shining and sharp (in its insight) as Merry's sword of Westernesse. I was very pleased with this post. Thanks so much, Cat, for your comment. Thank you in return! I don't know who you are, but I see you commented while I was away. I'm sorry if you've checked back and didn't see anything.